Java EE 8 continues its march to production. In this post we take a look at the developments made in the past month to the enterprise platform. Read on for details! Despite the traditional summer slowdown, the last few weeks have been important for Java EE 8. Here is a short recap of some of the progress made around the platform during the course of last month. In July, JSON-B (JSR 367) went final. That means that we now have 4 Java EE 8 related APIs that are final: CDI 2.0 (JSR 365), JSF 2.3 (JSR 372), JSON-P 1.1 (JSR 374), and JSON-B 1.0 (JSR 367). And that is excluding the APIs updated via a Maintenance Release, ex. JPA 2.2 which is now finalized, too. Servlet 4.0 (JSR 369) has finished the Proposed Final Draft period and will soon enter into the Proposed File Draft ballot. 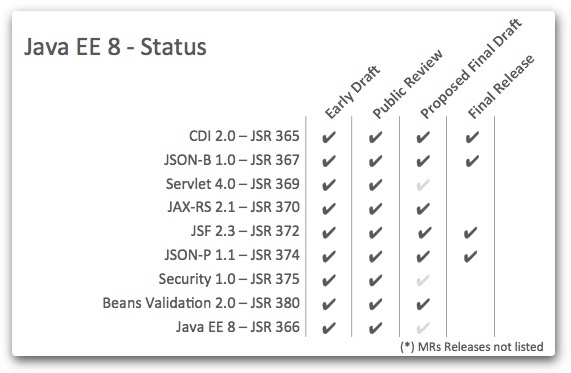 For JAX-RS 2.1 (JSR 370) and Bean Validation 2.0 (JSR 380), things went a little bit faster as both specifications went through their respective Proposed Final Draft period and have both unanimously passed their Final Approval Ballot in July (see results here and here). Congratulations to the JAX-RS and Bean Validation Experts Groups! 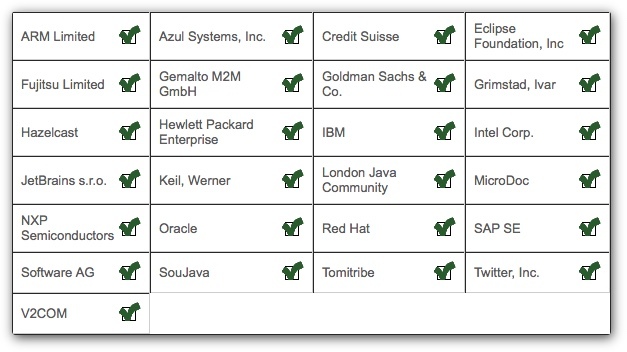 In July, the Java EE 8 EG published their Proposed Final Draft and they will submit shortly their Final Drafts to the JCP to enter the Final Approval Ballot. Mid-July, the Security API for Java EE (JSR 375) EG released their Proposed Final Draft and they're now actively working on the final technical details. As we are getting closer the finalization of the Java EE 8 platform, we have also accelerated the GlassFish 5 Promotion process. The goal is now to have 2 GF5 promotion builds per week. Talking about GlassFish, the number of stars on the GF GitHub repo is still relatively low. This is explained by the fact that the GF repo is relatively young. But as we are slowly but surely getting closer the final bits of GlassFish 5, it would be nice to raise that number. So if you are using GlassFish, do not hesitate to star it on GitHub. This small but nice recognition costs just one click!